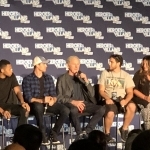 The Heroes and Villains Fan Fest emanated from the New Jersey Convention and Expo Center in Edison, NJ on September 8th and 9th, where the biggest stars from comics television and film were there and fans were able to pose for photos with them, get autographs, and take part in Q&A panel discussions. 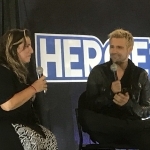 The fest heavily featured stars from DC’s TV Universe or “Arrow-verse” on The CW. 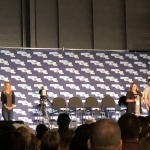 Stars from Arrow, The Flash, Legends of Tomorrow, and more were there as well as stars from Fox’s Gotham. 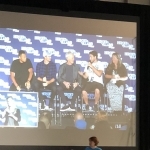 The opening panel of the weekend was the Firestorm panel featuring the trio of actors who’ve portrayed the character: Victor Garber, Robbie Amell, and Franz Drameh. The stars talked about their superhero favorites, and took an array of questions from the eager crowd. And moderating the panel was my wife Athena (Olympus Athens) and myself Dan (Dr. Zaius) of Geeks Of Doom. Check out the video of our moderating debut here below. The DC TV Universe returns to The CW this Fall. The Flash returns Tuesday October 9th; Arrow on Monday, October 15th, and Legends of Tomorrow a week later on Monday, October 22nd. 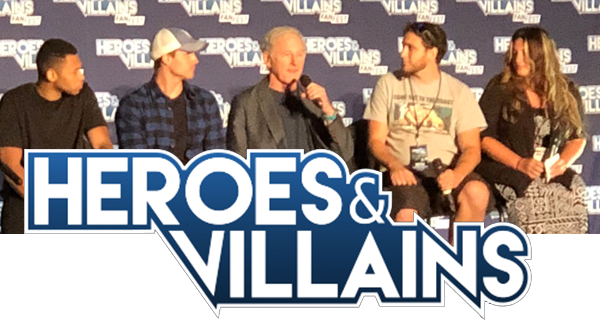 To find the next Heroes and Villains Fan Fest coming to your area, visit the official site. The fest returns to New Jersey on June 29th and 30th next year.